Guerrilla filmmakers aren’t a bunch of James Bonds or 1950s beatniks, but what they do has them constantly looking at the dangling boulder of consequence hanging over their heads. Being a guerrilla filmmaker often means filming illegally in public areas, where permits are required, but also means making a movie free of Hollywood standards. Guerilla filmmakers are working with significantly low budgets, on purpose. The movement believes strongly in the artistic effort. 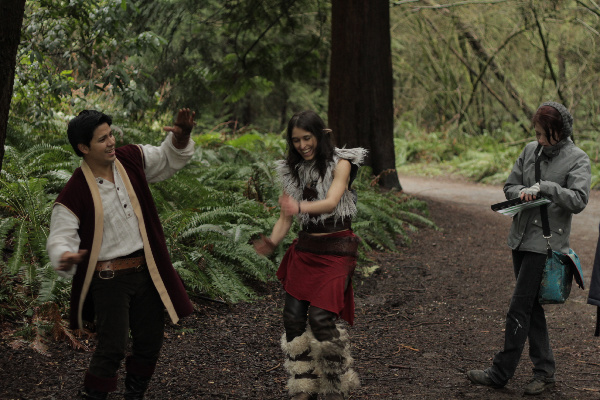 Rob Hunt, director of the fantasy-themed web series Standard Action, has one thought about the guerrilla work he has done in the past. “I would love to redo all the things I’ve ever made with the people who walk their dogs through the scene. You’re having an epic moment, and then dude and his wife walk by with their tiny dog. And it’s like, ‘Hey, just go through’,” said Hunt. And while the frequent possibility of people walking into frame is always keeping the guerrilla filmmaker vigilant, the much greater threat of facing a hefty fine for filming without a permit, or even being arrested, looms. Hunt recalls a story he heard about a filmmaking experience gone awry. “I know other people who have had issues…[a guy] had [fake] guns and they were filming in a house, so it was totally legitimate, and then one of the actors wandered out in the alley…and was posing with it, and then people called the cops and next thing you know, dude’s on the ground with a real gun pointed at his head,” Hunt said. Working on a tight budget already, having to cough up any amount of money to something other than their masterpiece certainly isn’t helpful. But what about the equipment? That stuff must not come cheap, right? It’s true, it can be costly to invest in the right equipment, but Hunt says that if you have a decent DSLR camera, such as a Canon Rebel T2i, and good sound equipment, including a boom mic, you’re all set to start shooting. You’ll also need a cast. Hunt recommends Craigslist as a good source of finding actors and crew members, but warns that it can also be a sour experience. “I’ve seen some great miracles happen from the people I’ve pulled off of Craigslist…just be ready to have a little bit of friction or find people who don’t actually help,” said Hunt. Guerrilla filmmaking allows those without the money to film big-budget productions live out their passion for making movies and being creative. Hunt is an advocate for it for one other reason. “You’ll see ideas come from independent film that studios are not willing to take a risk on,” he said. Some mainstream directors got their start working guerrilla style, including Black Swan director Darren Aronofsky and Malcolm X director Spike Lee. It was a little more than a year-and-a-half ago that a senate sub-committee for Simon Fraser University implemented the FD grade, also known as failure for academic dishonesty, in an effort to strengthen the school’s policies on academic integrity and prevent cheating by use of the internet. Today, SFU is still the only university in Canada that uses the FD grade, which stays on a student’s transcript for two years after graduation. Kate Ross, SFU’s registrar and executive director, student enrollment explained the rest of the FD grade’s process. “If no further acts of academic dishonesty have occurred [after two years], the registrar will automatically change the grade to F,” said Ross. Although no statistics on how many students have been affected by this grade have been released yet, SFU students have been generally accepting of the grade’s purpose since its introduction. General studies student Jayna Bhindi believes that the FD grade is necessary for students who cheat. “If I receive an FD, then not only does it mean that I plagiarized in that specific course, but it can also give the impression that I may have done the same thing in my previous classes and I was lucky enough to not have got caught, so whoever receives an FD receives it because that’s what they essentially deserve,” said Bhindi. Silvia Duran, also a general studies student, agreed with Bhindi. “[An FD] blatantly states the dishonesty that the student receiving the grade has practiced, and it not only shows future…schools, or even employers that you’ve failed, but you’ve failed for passing off somebody else’s work as your own,” said Duran. A third student, Alvin Gutierrez, has some doubts about the grade. “To me, there’s an inconsistency with the FD grade because what if a student simply forgets to put quotes around something someone said? I’m not sure how easy it would be to get out of that one,” said Gutierrez. The question now is whether any other universities in Canada will follow suit and implement an FD grade of their own. “We have certainly had inquires about [the FD grade], but to date I am not aware of anyone else introducing it in Canada,” said Ross. Kwantlen Polytechnic University’s director, admissions and records, Zena Mitchell, said Kwantlen has no plan of introducing an FD grade at this time. Talysa Dhahan and Brian Russell visited Fright Nights at the PNE on Oct. 23 for the first in a series of reports on events for students. The Kwantlen Student Association’s planned student union building (SUB) at Kwantlen’s Surrey campus, fees for which were passed in a KSA referendum last September, is still being discussed by the KSA and the university. Although it has been a year since the referendum, talks are still on as to what role Kwantlen will play in the creation of the SUB. “Following that successful [referendum], the university formed a joint working group with the KSA to discuss this initiative. The university is considering a joint project with the KSA for this building,” said Jody Gordon, associate vice-president, students. The SUB would likely be home to student-oriented services run by the KSA and other services that would appeal to students. However, exactly what all of these services, or possibly programs, will be, hasn’t been determined. “[Kwantlen and the KSA] are currently reviewing the type of programming that they would like to see in the building. At this stage neither party has finalized that programming,” said Gordon. Though this may sound worrying to students who had to pay a little more for their school fees this year, an end to the discussion and a beginning to the construction is in sight. “Over the next two months it is our hope that we will come to a joint resolution on the location, the size of the building and the applicable programming,” said Gordon. Kwantlen staff and students took part as a team in the AIDS Walk for Life in Vancouver on Sept. 19. Talysa Dhahan and Brian Russell share interviews from and discuss the walk, and also look at upcoming events students might enjoy. If psychology piques your interest, or if it’s your current field of study, then the Kwantlen Psychology Society might be the perfect organization to join. Of course, if you do fall into one of those two categories, you probably already know about this. The KPS is a “learning community” that holds discussions and events that benefit psychology students. It was created 10 years ago, but this is the first year the KPS has been associated with the Kwantlen Student Association. “I have been involved with the KPS for five years. In this time, I have seen an increase in membership and an increase in the frequency and variety of events,” said Jocelyn Lymburner, one of the faculty advisors for the group. Lymburner also noted that the KPS is the largest student club on campus. That’s significant for a group that focuses on a specific program, but Lymburner and Jamie Rich, president of the KPS, agree that the continued interest in the club is due in large part to the connection psychology students have to psychology faculty and other students. “[The KPS] puts together monthly pub nights…and movies nights where anyone can join us and be part of discussions,” said Rich. APA seminars are organized to give the opportunity for students to hear from a variety of speakers who are part of the psychology community, many of whom teach at Kwantlen. “Events are often attended by both faculty and students, allowing for increased interaction and relationship building with psychology faculty members,” said Lymburner. Amy Baykey, Social Events Coordinator for the KPS, said “anywhere from 20 to 40 people usually attend the [pub and movie nights]” but that those numbers are seeing some growth. Student led study groups are also put together as a way for psychology students to work together outside of KPS events. The next KPS pub night will be held on Sept. 22 at Wings in Surrey; anyone is invited to attend. The KPS is also online with Facebook, which you can find by searching Kwantlen Psychology Society, and on Twitter, under the name KwantlenPsycSoc. The strangest thing in the world is seeing Granville and Robson quiet and empty in the morning and packed with people from all over the world only a few hours later. Every Tuesday and Saturday for the last 17 days of the Olympics, I would wake up at 5:30 a.m. and make my way to Robson Square by SkyTrain for volunteer work with a company called DigiBC that specializes in technology for media outlets. Once at Robson Square, I got an almost eerie feeling seeing the streets around me empty, other than for a few reporters and Vancouverites starting an early day at work. Then, when my volunteer work was done, I would head back outside to see the previously roomy sidewalks turned into a giant international can of sardines. And yet, I felt as if I was at home among the thousands of people surrounding me. I realized that this is what the Olympics must truly be about. The power of sport brought the world together for two weeks and no matter where I looked, I saw everyone getting along, only gently pushing through crowds when necessary and being good sports about the sports whether their country won or lost. It amazed me that such a thing could happen. I was always one of the folks who were cautious about what having the Olympics in Vancouver would do to such a beautiful city. But being part of it changed my mind and at the end of each day, I honestly did not want to leave Vancouver. Unfortunately, I couldn’t be downtown when Team Canada won hockey gold on Feb. 28, but seeing what it looked like on television was enough for me to understand how thrilling it must have been. I’m curious to see the streets of Vancouver now that the Olympics are over. I wonder if the powerful feelings I’ve had there for the last two weeks can ever be achieved again.